I met Amirali Ghasemi over a decade ago. Wandering through a forgettable group show at a Tehran gallery, I found myself weirdly transfixed by a video of a fan. Just a fan, turning left and right. The artist, it turned out, was standing right there. “It was shown in Venice,” he mumbled distractedly. I looked at the monitor again, perplexed. (We were still in art school. This involved painting lots of trees.) We crossed paths many times afterward, while Ghasemi converted his parents’ garage into a studio, then a workshop space, then a gallery, with turns as a catwalk, lecture hall, and screening space — promoting each event with his distinctively designed posters and website. His calls for participation began arriving in a steady stream. Most of them involved video, which was now surpassing tree paintings in ubiquity at an alarming rate. Foreign curators started trickling in, and Ghasemi’s promotional instincts were unparalleled. In the somnolent haze of Tehran’s art scene, his “Parkingallery” was an inexplicably energetic hub. For many of us, he was the first encounter with that fascinating and despised practice, independent curating. So it’s fitting, then, that Ghasemi’s oblique sensibility finally made its way to New York, in the form of Iran via Video Current, curated with New York–based independent curator Sandra Skurvida. Their show drew strongly on Ghasemi’s immersion in the Tehran scene, yet was remarkably free of either historicizing tendencies or obtrusive curatorial mise-en-scène. The relatively empty gallery space and sparse seating made way for a large projection wall, where the five-hour program ran daily during the show’s one-week run. At a desk with a computer, visitors could play any of the thirty-four videos on the monitor. The setup was hardly conducive to an extended viewing experience, yet on each of my visits — including the packed opening — people were camped on the floor and leaning against the walls, silent, absorbed, and lingering as long as the space remained open. Ghasemi and Skurvida had each organized a program to be played in sequence. This division of labor could have easily led to the oft-seen (and oft-lamented) schism between artists working inside and outside Iran, but the results had more of the intuitive arc of a mixtape, as referenced in the title of Ghasemi’s program, If We Ever Meet Again… (With Hidden Tracks). Skurvida had initiated the project under the larger umbrella of her OtherIS curatorial initiative, which aims to facilitate exchange with countries sanctioned by the US. Her program, titled 1979/1357–, set the date of Iran’s Islamic Revolution of 1979 next to its equivalent Iranian calendar year. While her pamphlet essay described her interest in the ramifications of the “spiritual revolution” that so fascinated Michel Foucault back in the day, her selection felt much more open-ended. Still, shared qualities and themes are inevitable. Duration is a defining aspect of video, used to great advantage in the slow pacing of Nosrat Nosratian’s Fall (2009), where gently drifting microscopic organisms are suddenly squashed by a massive thudding ball that drops on them from above. With the threat of bombs over Tehran never far from the headlines, the metaphors aren’t too hard to imagine, but the work’s strength lay in its quiet abstraction. Contemporary politics may have provided the show’s curatorial premise, but the strongest works were those that avoided literality in favor of emotional resonance. In Jinoos Taghizadeh’s Good Night (2009), an unseen mother rocks a cradle for the twenty-two minutes of the work’s duration, while an offscreen voice sings haunting lullabies that are in fact rousing military anthems. 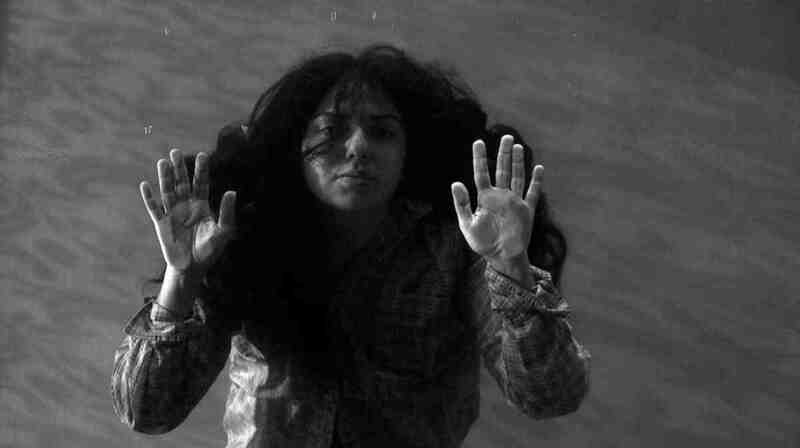 Kaya Behkalam and Azin Feizabadi’s Negotiation (2010) uses actors and narrative voiceover to rehearse an abstract postrevolutionary situation, removing historic specificity to bring out the structure of an irresolvable political scenario. Playing against their solemnity is the exuberant humor of Ramin Rahimi’s animated Red Thing, which involves a large red monster invading Tehran and attempting to capture the attention of its inhabitants in vain — a gentle social satire that owes much to the visual style of early 1990s MTV and Japanese anime. The political is naturally intertwined with the historical, and many works seem to have originated in their authors’ discovery of compelling archival footage. Shirin Sabahi’s elderly Swedish landlord turned out to be an engineer who had spent the better part of the 1960s and 70s in Iran. His 8mm films, a diary of Iran’s determined importation of industrial modernity, are accompanied by the engineer’s own occasional commentary, under the title Swede Home (pointedly dated 1966/1973/1979/2009). Shadi Noyani’s The Iron Heel (2011) shows her smiling family ceremoniously digging in their garden soon after the 1979 revolution to unearth their contraband copies of Jack London’s Iron Heel. The artists’ fascination with these time capsules is undeniably infectious, not least because of the care and simplicity of their presentation. If there is a thread that runs through all of these works, it is their self-conscious fragility as carriers of meaning. They invoke collectivity only to underscore its absence, and they hint at a historic narrative only to shrug off any shared ideals of progress. Mehraneh Atashi’s Gulistan (The Rose Garden, 2011) perhaps speaks to this best. The artist is filmed in six different settings (from Iran to the US), reciting an excerpt from the famed thirteenth-century text of the work’s title, from memory, at each site. It is the passage where the poet Saadi explains why he has set out to produce a work of such scope and ambition: “I shall compose a rose garden whose pages the autumnal wind cannot rend and whose vernal bliss the passage of time cannot turn to the woes of winter.” As Atashi tonelessly recites this passage over and over again, awkwardly distracted by her surroundings and the failings of her memory, her camera starts to break down. Eventually, her efforts are captured with no sound at all, as if deliberately proving Saadi wrong: even the artist’s voice cannot lend permanence to time and place. If Ghasemi’s title If We Ever Meet Again flippantly invokes the saccharine sentimentality of a pop song, it also hints at the threats of global war against Iran and the insidious effects of international sanctions. The brief run of the show gains a new poignancy, for there are no assurances that we will encounter these works again under quite the same circumstances.